The third edition covers a really special year: 2009. First of all, the big winner is the Kamailio project itself, being awarded Bossie'09 - Best of Open Source Networking Software by InfoWorld magazine, confirming its leadership in open source SIP server applications. Then 2009 represents the year of completing Kamailio (OpenSER) and SIP Express Router (SER) integration under http://sip-router.org project, resulting in version 3.0.0 as first release based on this work. As usually, the categories got two winners, listed in alphabetic order. Inaki Baz Castillo - developed a set of additional tools for usage with Kamailio (OpenSER), published at http://dev.sipdoc.net. He dedicated time to talk about the project at Spanish events, help with mailing list and sort out leaks in SIP presence specifications. 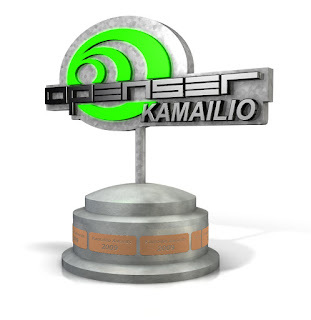 If you want to learn more about latest stable version, Kamailio (OpenSER) 3.0.0, read here, here and here. I am going to be present at CeBIT 2010, in Hannover, Germany, next week (Match 2-6). If you want to meet contact me. There is a lot to chat about last trends in IP communication, social networking and the role of Kamailio (OpenSER). A quick search on VoIP keyword revealed 136 exhibitors. It looks very promising! Next SIP Router Masterclass will take place March 22-26, 2010 in Berlin, Germany. Asipto launches a special offer to help upgrading to Kamailio SIP Router 3.0.0. At a price of 480Euro (plus VAT if applies), our team supervised by two co-founders of the project, will upgrade your configuration file to work with version 3.0.0. We can help migrating from any SER-based SIP server – SER, Kamailio, OpenSER or other variants (for example but not limited to: OpenSER v1.0.x, v1.1.x, v1.2.x, v1.3.x, Kamailio v1.4.x, v1.5.x, SER 0.9.x, a.s.o.). Target duration for upgrade is within one week, a matter of mutual agreement for special cases. Kamailio (OpenSER) 3.0.0 is completely based on SIP Router project, bringing loads of new features and improvements. This offer is for a limited period of 2 weeks, in a first come first served approach, subject of load capacity. Contact us to get your config upgraded at low price by the people who develop the SIP server. Asipto and Quobis work together to market and support SIP solutions for telecom operators and governments in Latam and Iberian markets. Quobis Networks and Asipto today announced a set of business collaboration agreements to market and support a series of solutions based on Session Initiated Protocol (SIP) for telecom operators and governments in LATAM and Iberian markets. Under this new model, customers will realize unprecedented flexibility through improved interoperability and manageability of the open source solutions developed by Asipto. Quobis will provide professional services in the phases of analysis, planning, design and certification for projects related with implementations of open source unified communications, where the company has a broad experience. During the last four years Quobis has worked in some of the most important projects in iberian markets. Main solutions included in this new portfolio are unified communications (IP communication sessions with NAT traversal support, presence and instant messaging, rich telephony features and media services), load balancing (customizable load balancing rules, with safeguard module to secure the SIP internal network, offer high availability and failover), prepaid engine (with per-second precision billing and multiple charging plans) and number portability (Number Portability Server with high capacity of records for ported numbers and ability to process thousands of requests per second). Quobis is an spanish company that helps leading companies turn challenging communication requirements into opportunities for growth using telecom emerging technologies like ITS, Smartgrids, Mobile WiMAX or open source VOIP. The team is formed by senior telecom engineers, with several years of professional experience working on consultancy, design, planning and project management within these technologies. ASIPTO has a strong background in Kamailio (OpenSER), SIP and VoIP. Backed up by two co-founders of Kamailio (OpenSER) SIP Server Project, the knowledge of the team is built on the experiences in VoIP since beginning of 2002, with world wide production deployments and active development of Kamailio (OpenSER). I will be present at Call Center World congress in Berlin, February 8-11, 2010. If happens for you to be around and want to meet, feel free to contact us. Asipto’s Load balancing solutions can be used to scale call center capacity in a transparent and flexible manner.